It was the offseason that was supposed to curve back into football for the NFL. Free of collusion grievances, protesting controversies fading, ratings recovering and some welcome silence from President Donald Trump. But on the doorstep of the league’s annual owners meetings in Phoenix, one set of offseason problems has been replaced by another. 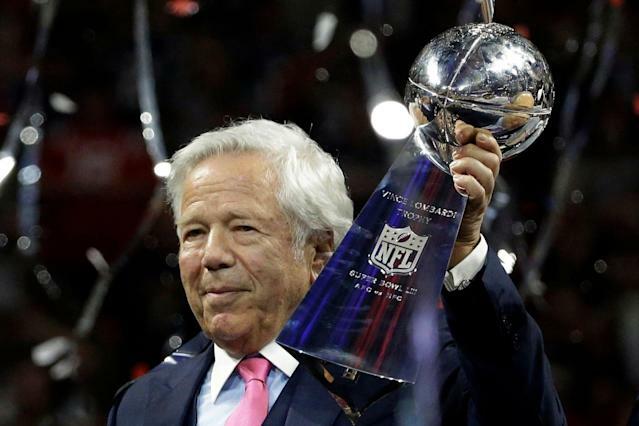 This year it will be the Robert Kraft meetings, with commissioner Roger Goodell and other NFL power brokers pressed to define the league’s stance on the prostitution-related case of the New England Patriots owner. And if the questions aren’t about Kraft, some will surely orbit the status of Tyreek Hill, the Kansas City Chiefs’ star wideout whose home address was recently tied to an alleged battery incident involving an injury to a minor. Like it or not for the NFL, those will be two front-seat stories, with each tied to a pair of governing principles that have been a constant topic of discussion in recent years: The varying application of the personal conduct policy; and the league’s use of its own investigative resources in the pursuit of personal conduct violations. Both will summon the same pair of question in the Kraft and Hill situations. Will the NFL be using its investigative resources in either matter? If a personal conduct violation is found by league investigators in either situation, what steps will be taken? Of course, neither of those questions addresses the public relations issues that are already looming overhead. In the Kraft case, there is a curiosity among some players and their union, who wonder how the league office will handle having such a powerful owner under disputed legal charges. And what steps the NFL’s investigative unit will take (if any) with Hill, who hasn’t been named in the still-vague battery incident. Kraft on Saturday spoke for the first time regarding his case, issuing an apology in a statement. The odds of getting almost any information from the NFL regarding its plans for handling either Kraft or Hill are low. But that won’t stop the questions from being asked and at least temporarily overshadowing a set of meetings that are likely to produce a solid amount of news. Expanding replay to include “judgement calls” such as pass interference, roughing the passer and defenseless player penalties. A change that would give both teams a possession in overtime regardless of what the first possessing team does. Giving NFL teams a bonus possession that would replace onside kicks in the fourth quarter of games. Per the rule suggestion, a team would have a one-time opportunity in the fourth quarter to replace an onside kick attempt with a 4th-and-15 possession from its own 35-yard line. If the team achieves a first down, it’s allowed to retain possession. If it fails, the other team takes over the ball wherever it is whistled dead. Any of those three rules passing would give the NFL a fairly significant rule change that would almost certainly carry the news cycle coming out of the meetings. Which would be a welcome development, given the alternative of Goodell answering questions about Kraft or Hill to close the meetings.